Riding on profitable trends with minimal risk and preventing losses from choppy markets are the two most important tasks for a trader to thrive in trading. 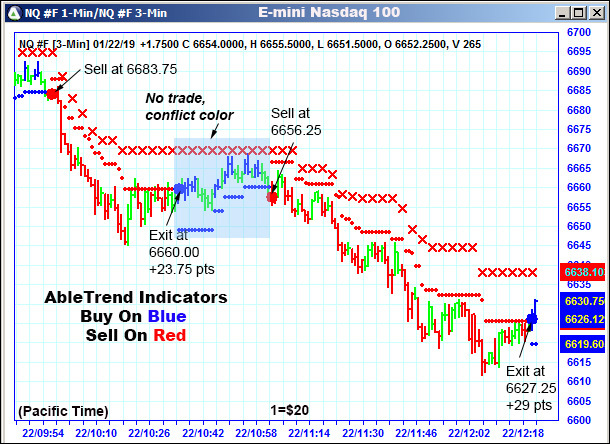 Below are two recent E-mini charts, one in a choppy market and the other in a trending market. AbleTrend Guidance Charts were applied to both charts. 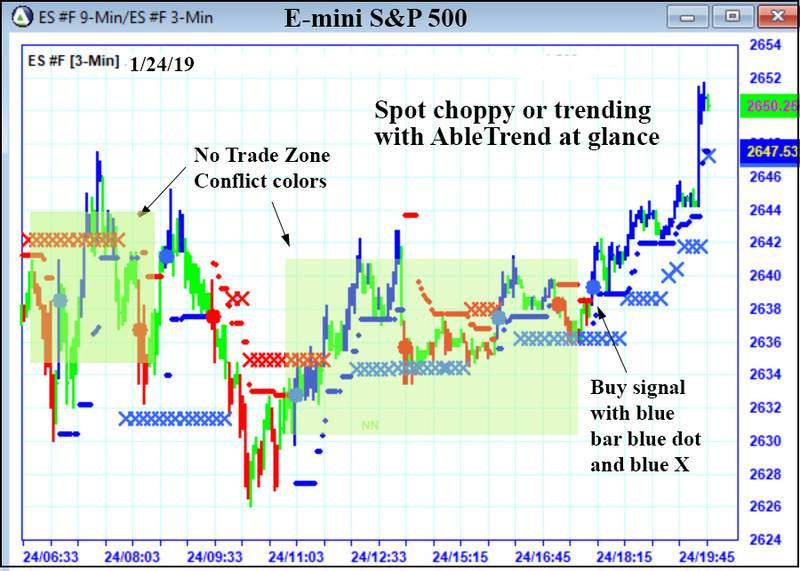 As you can see in the above chart, the AbleTrend Guidance chart combines 2 time frames into 1 chart and helps to filter out false signals with our No-Trade Zones. Small red dots are the resistance levels for 1-min chart and red X are the resistance levels for 3-min chart; Small blue dots are the support levels for 1-min chart and blue X are the support levels for 3-min chart. If the colors for 1-min chart and 3-min chart disagree with each other, that’s No-Trade Zone. As you can see in the above chart, the AbleTrend Guidance Chart combines 2 time frames into 1 chart and helps to filter out false signals. Within one chart it helps trader to detect the market trend with longer time frames (avoid market noises with shorter time frames), and yet it empowers traders to manage risks with tighter stops (compared to stops with longer time frames) and to get better entry prices. Once the 1-min dot and 3-min X has the same color, it confirms a trade signal. Learn more in AbleTrend webinars, view its performance in the chart library since 2006. As always, please feel free to forward this email to your friends.